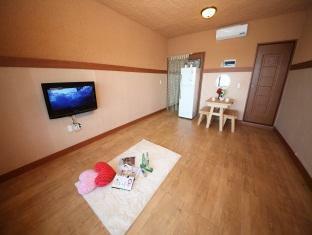 ﻿ Janggu Stick Pension, Namhae-gun - SAVE ON AGODA! Have a question for Janggu Stick Pension? Renovated in 2012, the Janggu Stick Pension guarantees guests a pleasant stay whether in Namhae-gun for business or pleasure. The city center is merely 15km away and the airport can be reached within 50 minutes. Also within easy reach are Imjinseong, Mangunam, Gacheon Daerangi Village. Offering hotel guests superior services and a broad range of amenities, Janggu Stick Pension is committed to ensuring that your stay is as comfortable as possible. This hotel offers numerous on-site facilities to satisfy even the most discerning guest. Experience high quality room facilities during your stay here. Some rooms include television LCD/plasma screen, non smoking rooms, air conditioning, balcony/terrace, fan, provided to help guests recharge after a long day. The hotel's golf course (within 3 km), garden are ideal places to relax and unwind after a busy day. 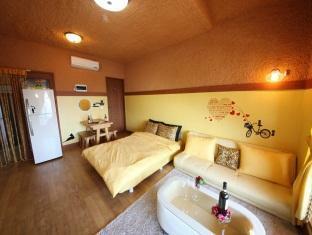 Janggu Stick Pension is an ideal place of stay for travelers seeking charm, comfort and convenience in Namhae-gun. Nice, pet friendly pension with kitchen/fridge/grill. Kitchen is grossly understocked so I always take flatware, plates, serving pieces, and coffee cups. Sunset is beautiful while you sit and cook your dinner on your porch! Views, unique style and value for money. Pros: - The view from the room is incredible! -The rooms are spacious, clean, and comfortable. -The location is calm and peaceful, and a nice change of pace from the normal hustle and bustle of Korean cities. We took a walk around the area and saw lots of garden patches, small houses, and farmers in their fields. - Some rooms have a small deck with a picnic table and grill. Perfect for watching the sunset! Cons: - The pension is a bit tricky to get to... Still not really sure how we managed to get there. Taxi+walking+random passing bus. - On Agoda the pension is called "Janggu Stick Pension", but the sign at the pension says "Mul Jang Gu Jae," Not a problem, but helpful to know to avoid any confusion when trying to locate the place. - There are no markets or restaurants within walking distance of the pension, so bring food! Our room had a nice kitchen with a hot plate, refrigerator, and pots and pans, so if you're prepared it's no problem. Bottom Line: The rooms are nice and the views are incredible. Just be prepared! Great little B&B type place. Beautiful view and great size room. bring your own food/snacks or Namhae is only 15 min away. good location for driving around the island and site seeing. owners didn't really speak English but we were able to get everything we needed. would stay here again. pleasant experience overall. It was a cool place to stay, away from the city where you can think and talk. We have been very satisfied with room, staff, roof bar, everything. Good price. we really did have a difficult time finding it because the name on the sign is not the same as given here. it was also only in korean on the sign and agoda only had the english. 생각 보다 작은 방, 시끄럽고 옆방의 소음이 그대로..., 그러나 꽤 괞찬았어요. 수영장이 바로 옆에 있어 매우 즐거운 여행이었슴.